Every year at SDCC there's one exclusive that's "the" exclusive: the star of the show, the one that everybody seems to be going nuts for. Last year it was Galactus, and this year it's Gozer the Destroyer - aka, the Stay-Puft Marshmallow Man. Before we get to the figure, we have to discuss the packaging. The figure comes in a 22½" wide, 17¾" tall, 10" deep box designed to look like a metal case, complete with reinforced corners, fancy latches, the whole deal. There's a handle on the top to allow you to carry the thing around, and the front has a picture of Matty's jackass face and a bit of text. Pro tip: when you're opening the box, open the bottom; the handle on the top holds the flaps together, so you can't get him out that way. Inside the box rests Mr. Stay-Puft in a large cardboard tray - what will eventually be the diorama. 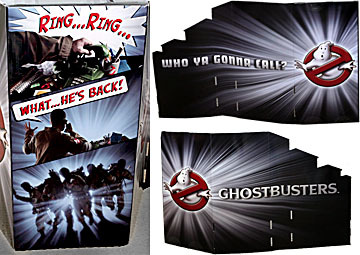 The back features a three-panel photo comic of the Ghostbusters receiving a phonecall telling them that Stay-Puft has returned. 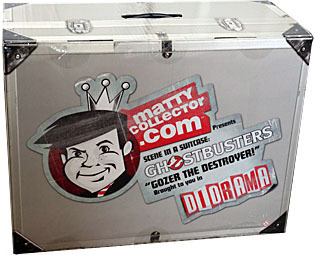 As you unfold the flaps of the diorama, one side reads "who ya gonna call?" and the other says "Ghostbusters." Both sides have the Gb logo with a black and white flare burst behind it. The (marshmallow) man himself is held in place by the same kind of paper twist ties Hasbro has been using for a few years now, which is very nice to see: Mattel probably chose them because they're less likely to cut into the figure's soft body than metal twist ties are, but it's still welcome to see more companies getting their act together. You can cut the ties if you want, or untie them, but there are a few you'll have to open up the packaging to get at - one even runs through the torso via the shoulder joints! Carefully cut the tape on the top and bottom of the box, and you'll be able to open the entire package (if you're planning to leave him in his tray permanently, you don't have to do that), giving you access to not only the ties, but also the tape holding in the plastic trays. 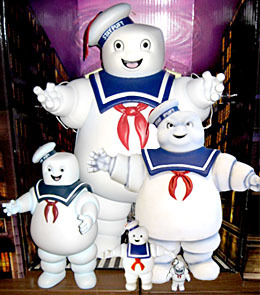 When people think of Ghostbusters, they think of two things: Slimer and the Stay-Puft Marshmallow Man. Slimer became the series' mascot, thanks to the cartoon and the juice, so of course people will remember him. Stay-Puft forced his way into pop culture by sheer force of awesome spectacle. The embodiment of the all powerful Gozer, the Stay Puft Marshmallow Man nearly destroyed New York City before the 100-foot tall gooey mascot was finally stopped by the Ghostbusters. His form was chosen by Ray Stantz, who was trying to think of the most harmless thing he could. Remembering his boyhood summers at Camp Oconda, roasting marshmallows around the fire, he went for a pleasant, cheerful corporate icon, something harmless that could never, ever hurt anyone. And when it comes to Stay-Puft toys, "something harmless that could never, ever hurt anyone" has always been a fairly accurate description. Kenner made one that was barely larger than the other figures in its series; NECA made the biggest one, but it's one of the hardest figures you'll ever try to find; DST made a decent stand-in in the form of a bank, but it was still pretty short; and of course, the various Minimate versions have all been just slightly larger than the humans. Not Mattel's, though! 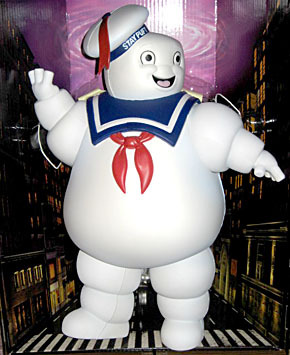 Mattel's Stay-Puft stands 20½" tall, which is still too small to fit with the 6" figures - remember, Gozer's destroyer form was about 100' tall, so to be in-scale, he'd have to be 100" (or 8'4" in real-world height). He's not even in scale with the Minimates! But at least in their case, he's three times closer to being the right size. After you get over your alarm at the size of the box, the next thing you'll notice is how very light it is. 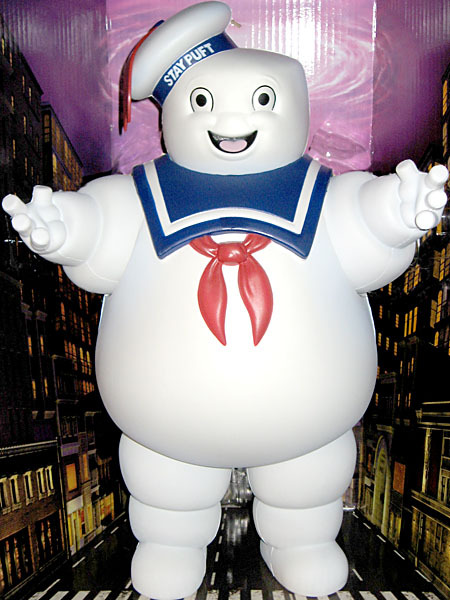 See, despite his huge size, Stay-Puft isn't made from the traditional ABS/PVC mix of most figures; he isn't even rotocast. Rather, he's made of some sort of spongy foam, like a slightly more solid Nerf. On the plus side, that means you don't have to worry about him falling apart or cracking over the years; on the minus side, there are prominent parting lines running through the middle of every bodypart. Obviously they can't scrape those lines off, like you would on a normal figure, but come on: this is a $70 toy, and problems like this should be minimized. Mr. Stay-Puft has decent articulation, considering his weird construction. He has swivel joints at the big five, which doesn't put him too far behind NECA's version. Considering that my previous "real" Stay-Puft was DST's bank, this is a step up. The body has no kind of texture, other than the natural texture of the foam, but the collar and neckerchief are molded elements, as are his facial features: though they're subtle, he has eyebrows, cheeks, a nose bump, an open mouth with a tongue inside, and a large lower lip. The paint apps are lacking: the lines are only about as straight as those on the Comicbook Guy ornament Rustin reviewed, and the blue on the back half of the collar seems paler than the blue on the front (though that may be because there was a piece of tissue paper back there, ostensibly to keep the paint from rubbing off on the plastic support behind him. The face is painted well, however, and that's what you'll usually be looking at. 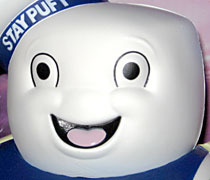 The "STAY PUFT" letters on the brim of his hat are actually molded on there, but the edges are still a little sloppy. The figure comes with no accessories, but there's more to this set than just Stay-Puft himself. 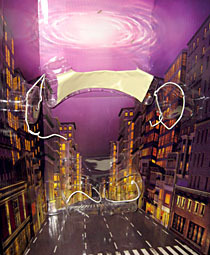 Like we said when talking about the packaging, it folds out into a diorama: a 61½" wide view of the streets of New York. Well, "street" of New York - it's just looking down one street, as Stay-Puft marches down it. The sky is foreboding purple with a vortex swirling in the center of it. 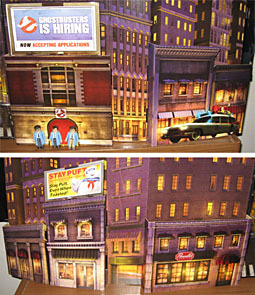 To add some depth to the display, there are four separate cardboard buildings that can be fit into slots in the display, including one showing the Ghostbusters' headquarters. It's a neat idea, but in practice, it doesn't work as well as it should. 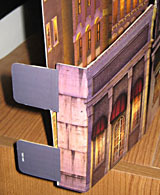 The two buildings nearest the center are fine, but the ones on the ends don't actually slot into the scenery completely: two of the tabs fit in properly, but the other two just hang off the ends. It's like Mattel intended the display to be just slightly wider than it is, but changed their minds late in the game. That is not good design! If you want those tabs (and by extension, the buildings) to stay in place at all, you'll have to tape them or something. Mattel's Stay-Puft figure is easily the second biggest toy I've ever owned (after NECA's Balrog) - he's gigantihugnormous! But that doesn't mean he's an easy buy: no matter how big he is, he's still a $70 investment, and he's still not in scale with anything. He looks better next to Minimates than next to Mattel's 6" Ghostbusters, though. The diorama is daunting in its hugeness, so you'll really need a lot of shelf real estate if you plan to display it open. But it will also make a killer display for any characters who might be in a city (eg, Marvel Universe or GI Joe). 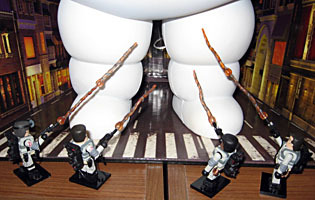 If you want the most detailed Stay-Puft, track down NECA's; the most economical, get DST's bank. 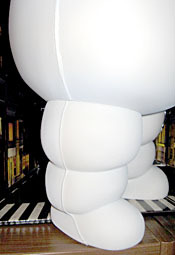 But if you want the best Stay-Puft regardless of price, this big guy is the way to go.